Canton introduces its 3 Way Floorstanding Speaker the Nestor 603. This product features 150 watts of maximum power, a stylish black finish, and a pair of 3-way bass reflex Nestor 603 Speakers. Look cheap. Have a problem with where the input is found at the very bottom of the rear cabinet. The metal grille only makes them look that much cheaper. They collect dust so if you have no kids remove those grills. clear hights and pretty mutch solid but very strong bass. This is perhaps not the highest quality speaker for livingrooms but if you can get them for a lower price they will do just perfect in a 5.1 setting in the rear. I bought these Nestor603's (new!) a few years a go for great price and they please me verry wel. They are connected wth a very strong Pioneer amplifier, the sound is best described as heavy and clear. they can take a lot off power before they start sounding less solid. Litle more thighten bass would be great. 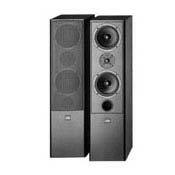 I got my Nestor 603''s with a Yamaha RX-V 569RDS A/V reciver, and i like them very well.. I got them at a really good packetprice I couldn''t refuse.. I think the bass colud be a little more thigt, but all in all the speakers sounds REALLY great for the price.. I''m very happy..